For example, maybe you are pitching at a demo day for your accelerator program in front of a large audience and you are told to keep good eye contact with that audience. How do you do that!? There are 200 people in the room, it’s dark and you can’t really see anyone at all… How do you make sure you have good eye contact when you can’t even see anyone’s eyes? Like the teacher that calls on you when you are daydreaming in class, eye contact has the effect of keeping your audience awake and pulling them back in to your pitch. In fact, we’ll have a tough time connecting and drawing them in without good eye contact. It is key for making sure we are able to connect with our audience and convey our information to them while keeping them engaged. Our audience wants to be talked to, they want to have a conversation with us – even if it’s a one-sided conversation. They want to have a back and forth and feel like we are paying attention to them. If we ignore them by not keep good eye contact, then they are going to ignore us and not pay attention to our pitch. Let’s imagine that we are talking to a small group of people. How would we keep eye contact with just five people? It should actually be pretty easy because this is a pretty intimate setting and likely everyone will be close to each other during the course of your presentation. Let’s look at how we might do it. First, make it a point to look at each person while you are talking. Say a sentence to that person and then look at somebody else. We are going to look at each person’s eyeballs at different points during the presentation. That is easy to do with five people as you can see them, they are very likely closer to you and the environment is virtually distraction free compared to larger group sizes. Now let’s expand that out some and say we have 20 people in the room. When you have 20 people in the room, it is just about the same as when you have five people in the room. Pick three or four, maybe five people across the room, at different points in that room. Make sure you hit someone in each section, to the left, in the back, and to the right, at least. Maybe a few more, maybe the room is an oblong shape, so we have to turn to look at the people sitting way over in the corner. We pick 3-5 people (at most) in that room, to look at them, to have eye contact with them. What works about that is when we are able to look around the room, everyone thinks we are looking at them. It’s close enough. When you look at one person in an area, everybody in that area can think that you are looking at them and that they are getting the attention they deserve during your pitch. We want to make sure we spend a little bit of time on each person. You do not want to just bounce around the room, that would be a little crazy. You want to spend a couple seconds, finish a sentence. Then look at somebody else, a couple seconds, finish a sentence. Then look at somebody else. Make a point. We can look at somebody long enough to make a point. We should do that because we don’t want to look around a ton, but we also don’t want to look to long like we are taking forever to look at one side of the room before we finally look at the other. We want to balance it out. Let’s expand it one more time to a bigger audience of 200 or even 20,000 people. Although most pitches and pitch competitions will have alot less people than this, we want to cover all the bases here. At this point, it’s very unlikely that we can see faces but we basically do the same thing we do for smaller audiences. The main difference here is that you have to assume the connection instead of seeing actual people. Pick a general space in the audience where you see an opportunity where there is a large amount of people. If you find something to key off of, something that stands out in the audience, like a camera-man or a post or a piece of the building. If there is something that you can key-off of and say, “these are the three posts that I am going to look at”; you can replace items for people and the people around those item can see you. If you are presenting in front of a large amount of people and also cameras, you can spend some of that time, not all of it, looking at the cameras. Unless you are supposed to look at the camera – you are being recorded and you’ve been informed to look at the camera the entire time, instead of an audience – then do that. Most of the time you are presenting to an audience and being recorded so you can spend some time looking at the camera but not the entire time. Use it as one of your people and that should work out just fine. Hopefully that answers your question of how to make an entire room – regardless of size – 5, 20, 200,000; feel like you’ve been looking at them and paying attention to them and engaging with them as you pitch. Thank you so much for joining us for us our Pitch Hack of the Week. I hope you found it useful. If you have any thoughts on which you have dealt with speaking in front of a crowd, whether you have found other solutions to making eye contact in a crowd, I’d love to hear about it in the comments down below. Let’s make it an ongoing conversation. Additionally, if you have any Pitch Hacks that you would like us to talk about next week, I would love to hear those as well, so please submit your request for Pitch Hacks in the future.  Also, feel free to subscribe and like this video if you find it valuable and you want to know more about pitching, pitch decks and pitch hacks from Pitch Deck Fire. That’s a lot of pitches! We do new Pitch Hacks every week, so I hope to see you here again.